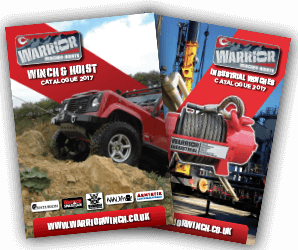 Here is a calculation will help you choose the correct winch for your application, all winches are rated on a DEAD WEIGHT line pull and can pull in excess of the rating on rolling loads and wheels. For example you want to pull a steel bin on wheels up a 30% cement grade with a total weight of 5 tons, What line pull do i need??? How do I install my 8000-20000lbs recovery winch? All recovery winches whether they are 12v or 24v DC need to be powered by a heavy duty 12v or 24v battery or a series of batteries connected together. All recovery winches from 8000-20000lbs are supplied with a ESB (Emergency Stop Button) this has to be installed in the positive line for safety cut off. Negative earth leads are provided and MUST be connected to the main battery negative to create a good circuit, if your black earth cable is too short to reach the battery terminal a extension cable will be required (Can be bought separately). How do I install my UTV or ATV winch? All ninja winches come complete with battery leads (Red & Black Long leads) and also the motor leads (Red & black Short leads). On installation of your new winch you first need to connect the black & red motor cables (short leads) to the winch motor from the solenoid box and then connect the positive (Red) and negative (BLACK) cables to the battery terminals. If you choose to install your recovery winch using a prefabricated mounting plate (Sold separately) there are different models to suit different winches. My winch will not work from new? Most common cause is the user has not connected up the RED & BLACK power cables either to the battery or to the motor (Only applicable on a NINJA series) or powering 12v or 24v battery is low and under load drops. Check all leads and connections to test battery use a battery load tester. My wireless remote transmitter will not work? To test whether or not it is WRC or winch simple plug in the wired remote lead and try the winch if it works it points to the WRC system has a fault. Most common cause is the user has not installed batteries into the transmitter handset or the battery is low. Another common cause is low voltage to the receiver. What battery type do i need? On todays market there are only two types of batteries Leisure and Deep Cycle, both can be used as winching battery but MOST common is Deep Cycle (Starting Battery) with a minimum 650CCA. Deep Cycle Batteries (Starting battery) are built to directly power electric motors, heating elements, winches, compressors, fridges, information processors and other electrical devices. they are designed to allow repeated full 'dis-charging' and charging without shortening the lifespan of the battery. An ordinary lead-acid car battery is kept topped-up all the time by the car alternator and never runs flat. If it does - its life will be foreshortened significantly as it cannot survive being below 90% charge for very long. This is a trade-off in the form of CCA power instead. Deep Cycle Batteries by contrast are built with heavier charge and discharge cycles in mind and can be used up fully / remain uncharged for longer periods of time with less deterioration and fewer adverse affects on the overall performance. Generally a 3 figure number the 'Cold Cranking Amps' (CCA) are the battery's ability to throw plenty of power into the starter motor and engine first thing in the morning or otherwise from 'cold'. The 'cold' refers to when the engine is started from cold - e.g. the engine has cooled to below a few degrees celsius whilst the vehicle has been parked up. A cold engine, as opposed to one that has just been running at optimum temperature, will take more energy to start and thus needs plenty of CCA from the battery. The reason for this is that the moving parts of the engine when cold encounter more resistance as they move against one another. Metal (or metal alloy blends), similar to most materials contract and become physically smaller / tighter when cold. The amount of contraction may only be a few thousandths of a millimeter but in a car engine where mechanical tolerances are very fine - it can make, especially in older vehicle designs, a big difference to the job the starter motor has to do. Diesel engines typically need more CCA for example than petrol equivalents due to them being a much heavier design in general. Diesel engines require certain parts of the engine to be heavier / thicker walled than their petrol siblings and need more CCA to crank them over at startup- especially in winter! Your car can take a new battery with the same or more CCA but NOT less! The charge that a battery holds can be likened to the usable amount of potential energy it has. Similarly - to charge a battery is to increase that amount of energy to a certain extent so obviously a battery can be full or empty like a cup. Ordinary Lead Acid batteries such as car batteries need to be regularly charged and kept topped up by the vehicle alternator to keep them working properly. If, for any reason the battery's energy levels fall below a certain amount and stay there for prolonged periods of time - it will become unreliable. By contrast a mismatching alternator fitted by a bad mechanic will slowly ruin the battery by overcharging it. Most types of battery, whilst charging will feel warm to the touch. This is quite normal. If the battery(ies) start to feel too hot to touch then there may be a problem. During charging, lead acid car batteries generate a by product called oxyhydrogen gas. Oxyhydrogen gas in great quantity in an enclosed space can explode when exposed to sparks, lit cigarettes and so on. When most types of battery have overheated the chemical compounds inside will change due to them having been cooked. Generally the unit will at best be unusable - at worst will melt, deform or explode, often into flames. Smoke or vapors from overheated batteries can also be very toxic. It is generally a good idea to keep the area around charging batteries well ventilated especially older technology. Do not couple up any type of battery charger to a battery unless you are certain the pair are suited. Some combinations e.g. using grandads old charger on your AGM battery will probably, if not definitely cook it. The same applies to mobile phones and laptops etc etc etc. Can a winch be used for lifting? Winches are a pulling device and don’t normally be used for lifting application. If you choose to use your winch for lifting application we strongly recommend terminating the free spool option for your own safety. My scaffold hoist will not work from new? Most common cause of your scaffold hoist not working from new is the ‘Safety Interlock Key’ has not been inserted. Your hoist is supplied with a interlock key attached to the hook that needs to be inserted in the red interlock switch, first remove the dust cover on the bottom of the interlock switch assembly and insert the key to power up the hoist.